Find out what events are coming up at the orchard and how you can help to keep everything moving along. There’s usually some type of work coming up and we’re always pleased to hear from those volunteering to help out. Have you got a fruit tree growing in your garden? Tell us about it and help us create a fruit map of the village. 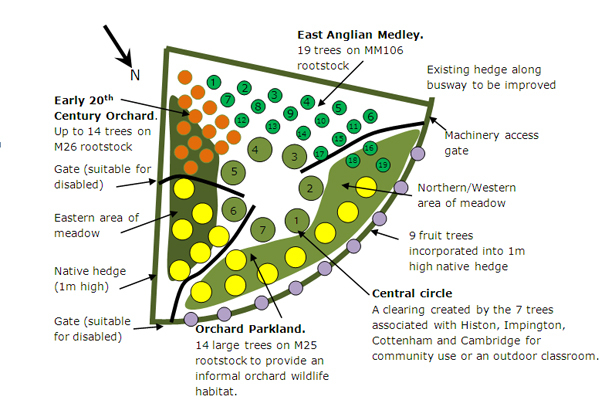 Coming up on 4 years after the idea of a Community Orchard was first discussed we have now planted the final round of fruit trees – mostly comprising the 20th Century section of the orchard as well as a couple of larger trees that couldn’t be supplied last year. In the next few weeks we are going to be starting work on the wildflower meadow (plan for meadow). As part of this process we are going to be encouraging the local schools and pupils to grow some wildflower seeds in trays that can then be transplanted into the meadow. If you or anyone you know would like to take part in this scheme or want to request a kit, please contact us and let us know. We’ve recently published the plans for establishing the orchard on the site – have a look if you want to know more about what’s coming over the next months and years. It’s still a work in progress and details may change, but we’ll try to keep it up to date. We aim to send out quarterly newsletters. Sign up to join the other subscribers. The newletter list is managed by MailChimp. When you sign up you will receive a confirmation email from MailChimp, until you confirm your subscription you are not signed up. You can unsubscribe from our newsletter at any time.